Leasing Available from $11.13 per month! Leasing Available from $15.00 per month! Looking for Oki 620 & 621 Parts? 1ML620/621 SuperSpeed Draft; ML690/691 up to 480 cps. 2ML621/691 at 13 million; ML620/690 at 8 million-character life. 37 sheets max with optional top pull tractor. 5Roll paper stand for ML620/ML690 only. * Please check the product brochure (PDF) for additional part numbers/SKUs. ** Published performance results based on laboratory testing. Individual results may vary. The MICROLINE (ML) 600 Series from OKI Printing Solutions: high-volume versatility in forms and correspondence. 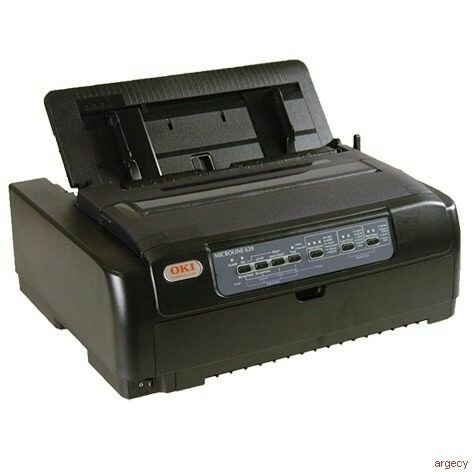 Whether your output is continuous multi-part forms or fine business correspondence- or combinations of both- you'll find your solution in the Dual 9-pin ML620/621 or the 24-pin ML690/691 dot matrix printers. They handle the printing needs of the most demanding environments-including point-ofsale, automation and utility applications such as wholesale or retail sales counters, financial departments, manufacturing and warehousing. Yet they also produce letter-quality type and high-resolution graphics for the office and executive suite. Fast, with finesse- ML600 Series printers run the gamut of paper types and envelopes at lightning speed. Their rugged printheads have a 400 million-character average life expectancy, with powerful samarium magnets and stored-energy pins that deliver precise, sharp characters through to the last page of a 7-part form3. Sturdy and sophisticated- Field-proven reliability is just one reason OKI MICROLINE printers are the most widely-used impact printers in North America4. The rugged, reliable OKI ML600 Series printers are sure to win you over, too! Step up to superior performance- OKI Printing Solutions provides products that increase our customers- performance without affecting their budget. That's because the tradition of the OKI brand is one of proven reliability and value. You can expect more from MICROLINE 600 Series printers: faster speeds... better performance... greater reliability. 2ML621/691; ML620/690 at 8 million-character life. 5Available in the U.S. and Canada only. 6Roll paper stand for ML620/ML690 only. Resident Scalable Fonts Courier and Gothic 22-216 pt. Courier and Gothic 22-216 pt.